She's Fantastic: Transformers: Prime ARCEE! She's back and bluer than ever. The most popular fembot in all of geekdom gets a total redesign for the Hub's new action-packed CGI series Transformers: Prime, and much to everyone's surprize, there are already THREE versions of this incarnation in plastic. Did I mention this series has only been on the air for a little over a year? It's impressive that Hasbro is including her in the initial waves of all of the toy lines, but it just makes it all the more baffling that they never produced a classic G1 Arcee like fans have been begging for. They clearly understand the popularity of the character. My bet is that the Hasbro execs can't risk putting a pink toy in the boy aisle... which is ridiculous, but I almost guarantee that's the case. If she had to be redesigned in boy colors to get these figures, then it was worth it, because these are some of the nicest fembots I have ever seen. This review will focus mainly on the newest of the three figures since I just found her at Toys R Us this week. This version is from the line: Transformers: Prime - Robots in Disguise - Deluxe. Her packaging is bright and colorful with lots of graphics from the cartoon showing her design in bot mode. Out of the box, Arcee is a pretty plain looking motorcycle with a lot of interesting sculptural details, but overall the bike looks flat and uninteresting. Some slight color variations to this mode would add a lot. Here are all three current bike modes together. On the left is Transformers: Prime - First Edition Deluxe Arcee; in the middle is Transformers: Prime - Robots in Disguise - Deluxe Arcee; and on the right is the miniature Transformers: Prime - Cyberverse - Legion Class Arcee. There's something about the First Edition figure that looks much more realistic and less plasticy than the Robots in Disguise version. Before I continue reviewing the figures in bot mode, here are some pics of all the figures in their packaging. I found my First Edition in a Toys R Us right before Christmas this year (12/2011). Apparently it was supposed to be heavily restocked in stores this Spring but all the orders were cancelled. 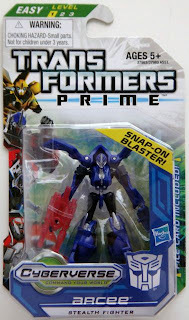 The Cyberverse version I found a few weeks ago at Target (2/2012). 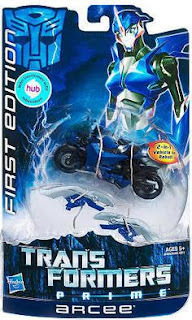 And I snagged the Robots in Disguise figure at Toys R Us this week (3/2012) - and I also saw her in Target that same day. Here is the Robots in Disguise version in robot mode. I think she looks great. She really captures the cartoon style and has a great feminine yet functional body design. (Often we see female figures with less articulation and flexibility in order to give them a superficially feminine look.) Her face has a lot of personality, too. The only real flaw with this figure is the excessive amount of kibble that hangs down her back in robot mode. It's basically the entire front end of the motorcycle trying to look inconspicuous between her shoulderblades. She looks awesome from the front though so I'll cut her some slack. Arcee comes with a giant gun/blade thing that looks a little silly in her hands. It's remarkable how poseable and graceful these fembots are becoming. Those early Energon Arcees look like toasters in comparison. Here are some close-ups in the same order. Don't scoff at the little one! Here is a comparison shot with the Transformers: Animated Arcee figure from 2 years ago. She was the best Arcee figure made up till now (in my humble opinion). I think it's amusing how she seems to dwarf the two Transformers: Prime figures considering I always thought she was so small. Here is a group shot with most of the modern female Transformers from the last few years. Added are the NYCC exclusive pink Transformers: Prime First Edition Arcee and the Transformers: Animated Blackarachnia. I'm going to end this review by highlighting one of my favorite features of all these modern Transformers toys: their backlit eyes! For those who haven't held them in person, the heads are mostly composed of transparent plastic with a large area exposed on the backs of the heads, and just the eyes exposed on the front. This causes an awesome eye-glowing effect even under relatively low lighting conditions. It's pretty simple yet amazing. Prime First Edition Arcee all the way. Future versions of Transformer toys should take note. Does she have an autobot logo..? Great question! Apparently she does not. Mine clearly doesn't and I just looked at a bunch of pics on ebay and it appears mine is not a fluke. Curiously, there is a "shield-shaped" area on her upper chest that is clearly intended for the logo. And in fact, the later Beast Hunters Arcee retool did have a logo there. Thanks for asking, I never noticed this before.